Transform your file into a pdf, html, or Microsoft Word document—even a slideshow—at the click of a button. Embed R code into your report. When you render the file, R will run the code and insert its results into your report. Use this feature to add graphs and tables to your report: if your data ever changes, you can update your figures by re-rendering the report. Make interactive documents and slideshows. Your report becomes interactive when you embed Shiny code. 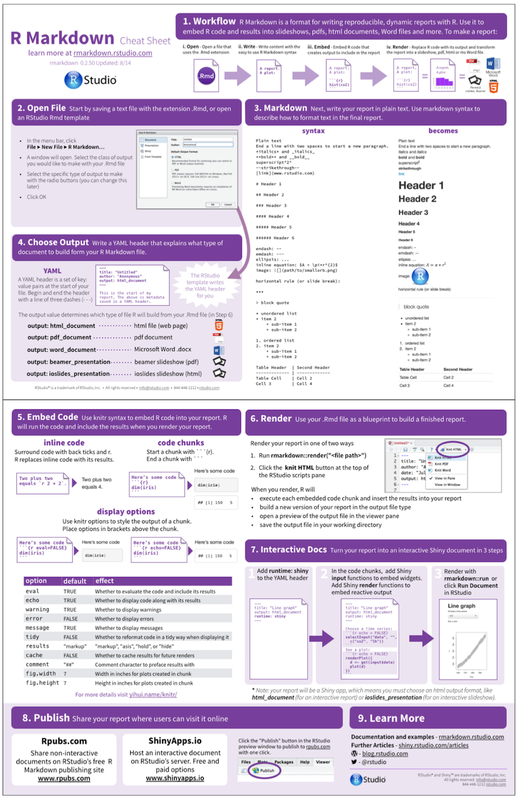 We’ve created a cheat sheet to help you master R Markdown. Download your copy here. You can also learn more about R Markdown at rmarkdown.rstudio.com and Introduction to R Markdown.